These squirrels are omnivores, they eat acorns, hickory nuts, seeds, berries, mushrooms, flower blossoms, tree bark and sometimes insects, bird eggs and mice. While eating nuts, they will cut a hole at the end of the nut to eat the insides leaving the shell intact, unlike other tree squirrels that fully crush the nut in order to eat it. The Southern Flying Squirrel is the smallest squirrel in our area. Adults weigh between 2 and 3 1/2 ounces. The dense, soft fur is grayish-brown above and a creamy white underneath. 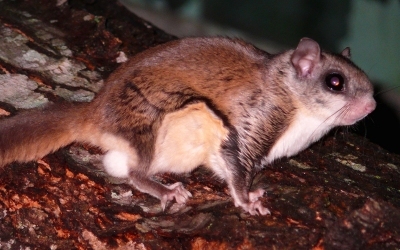 The eyes of the flying squirrel are exceptionally large in relation to its body size. At a glance the flying squirrel looks like it is ‘flying’, but in reality it glides from branch to branch. The most noticeable feature is the loose fold of skin which extends from the wrists of the forearm to the ankles of the hind legs. This fold of skin is stretched when the legs are extended to form a wing-like surface that allows the flying squirrel to glide from tree to tree. The tail is furred and flattened. Flying squirrels are members of the rodent family. Like all rodents, to keep their teeth sharp they must chew. Homes with flyer colonies often have chewed electrical wires which, if gone unnoticed, can a fire hazard. These animals will set up a "litter box" that can produce stains and smells that are unbearable. The most common complaint from New Jersey homeowners is from the noise in the walls at night these critters make. It is hard to sleep when you have 30 flyers storing acorns in your home every night.